I’m sharing my tips and tricks for the perfect white rice, every time! No more excuses for bland and just blah tasting white rice. I have three simple steps I use when making my white rice to ensure a perfect texture and flavor. You want that rice to be buttery, salted and flavorful. So many times in life we over complicate the simplest of things and overwhelm our selves. I myself have gotten so frustrated with rice being over cooked, under cooked and just over thinking it all together. Making something as simple as rice complicated is basically the metaphor for my life thus far, and it’s time to stop that. My goal for 2017 and on is to complicate all the decisions that I am making more difficult. How to do that? Well, add a few more simple things to my life that will impact the results immensely. One, stop overthinking (easier said than done). Two, wake up each day and say “Thank you” before getting out of bed (before running to my toddlers room at 4:45 am). Three, never go to sleep without telling my family how much I love them and how thankful I am for them. One: Use salt, butter and one bay leaf to flavor the rice while cooking. No one likes rice that taste bland so make sure you season properly. Two: Do not over cook the rice or add too much water. 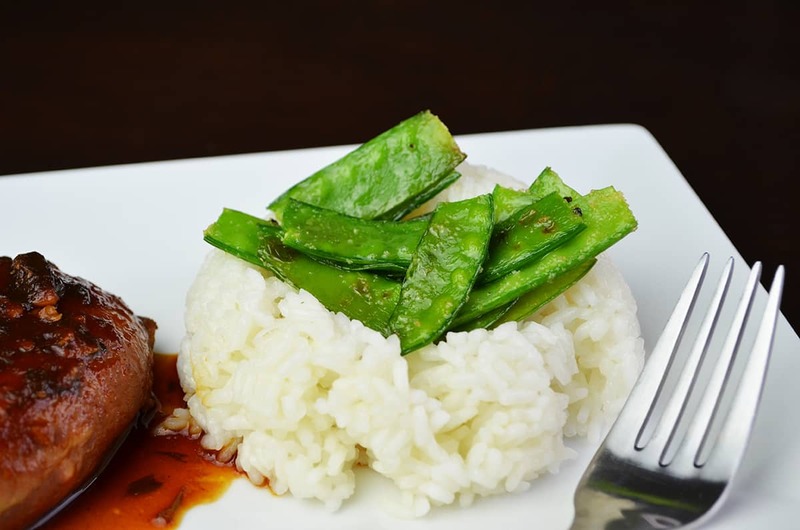 Just like no one likes bland foods, most do not like mushy over cooked rice. Three: Last but not least, roast some simple snow peas tossed in salt, pepper, garlic powder and olive oil for a crunchy finish. Do you see that sauce slowly working its way over to the perfect white rice…That would be The Best Crock Pot Chicken, a must try!